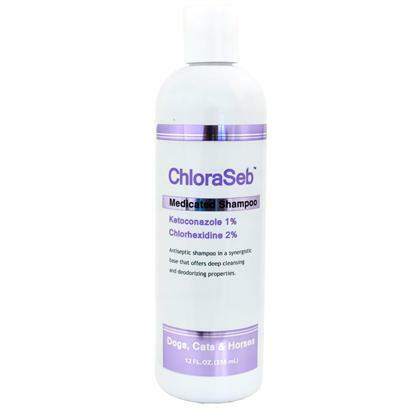 ChloraSeb shampoo is a pleasantly scented shampoo with antiseptic activity (antibacterial and antifungal) designed for dogs, cats, and horses with dermatological conditions responsive to chlorhexidine and ketoconazole. This antiseptic shampoo offers deep cleansing and deodorizing while disinfecting and preventing the growth of disease-causing microorganisms. Avoid contact with eyes or mucous membranes. If eye contact occurs, rinse thoroughly with water and consult a veterinarian. Not for otic use. Wash hands after using. If undue skin irritation develops or increases, discontinue use and consult a veterinarian. For veterinary use only. Keep out of the reach of children. Shake well before use. Wet the hair coat with warm water and apply a sufficient amount of shampoo to create a rich lather. Massage shampoo into wet hair coat, lather freely. Rinse and repeat. Allow to remain on hair for 5 to 10 minutes, then rinse thoroughly with clean water. May be used initially 2 to 3 times a week for 4 weeks. Use once a week, or as directed by your veterinarian.